Fay Nicolson will read a chapter entitled 'Script for a School Play' from her 2011 text 'Never Odd or Even'. This section of text explores the concept of 'latency' (as a gap or delay in time) and draws abstract connections between data, language, time, work, education and understanding. Never Odd or Even was originally published in A Circular (Issue 1), 2011. Do you find being fixed in space and time a bind? Would you like to know all possible scenarios at once? Discover multiple answers to the fundamental questions of your life with the Oracular Sponge (Version 003.1a). The Department of Foresight (part of the School of the Event Horizon) will launch their new time granulation device with a talk and demonstration. Cathy Haynes attempts to divide and order shadows by type and value, with category notes on street lamps, retromancy and the Sun god Ra. 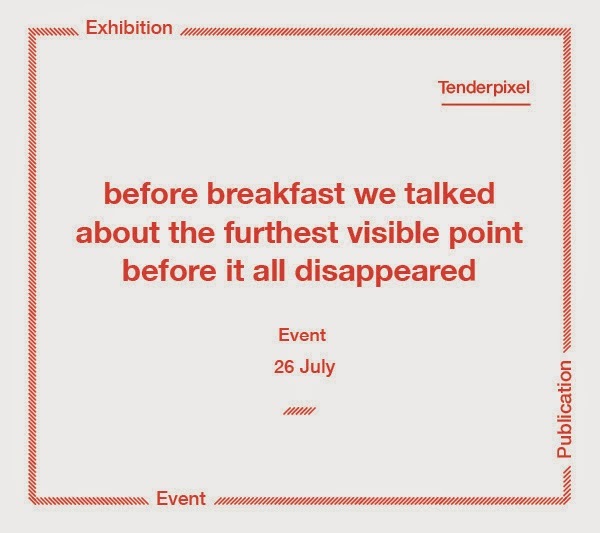 before breakfast we talked about the furthest visible point before it all disappeared is a multifaceted project that includes a group exhibition, an event and a publication produced in collaboration with Tenderbooks. The publication gives space to the research leading into the exhibition and events, but also allows for parallel investigations to unfold and ideas to diverge. While the publication will be circulated and distributed during and after the exhibition to ensure an afterlife to the conversation, the events will provide an opportunity for a wider audience to engage with the thinking process, to share anecdotes and corresponding ideas.